Angry riots set off by surprise takeover of city by renegades U.N. soldiers fired on rampaging protesters in Congo's capital yesterday, killing at least two, as the surprise capture of an eastern city by renegade commanders prompted the most violent protests here since the outbreak of the country's 1998-2002 war. State radio said that U.N. soldiers from Ghana were responsible for the shooting. 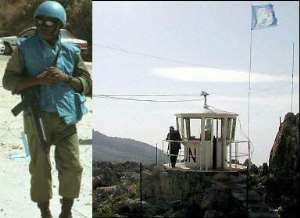 The U.N. would not give the nationalities of the soldiers who fired. Crowds turned on President Joseph Kabila's government and Congo's 10,800-member U.N. force for failing to stop the fall of Bukavu, surging into the streets by the tens of thousands to attack U.N. installations. "The state is dead!" protesters cried in the demonstrations that broke out at daybreak, filling the city center with chants. Swinging wooden clubs and converging on U.N. posts, they promised, "We will punish the United Nations ourselves." Despite the bloodshed, hope rose of defusing the crisis for Congo's fragile postwar government when renegade commanders in the east agreed to end their takeover of Bukavu by today. "We shall withdraw ... to assure the transitional government that we are not opposed to it," pledged Gen. Laurent Nkunda, one of the two commanders who broke from ranks of the government's forces and seized Bukavu on Wednesday. Kabila blamed Rwanda, Congo's primary foreign adversary in the war, for the fall of Bukavu, a strategic trade center on the Rwandan border. Rwanda denied the charge. In New York, Jean-Marie Guehenno, the U.N. undersecretary-general for peacekeeping, blamed the violence on unreasonable expectations among Congolese about the U.N. peacekeepers' ability to control militants. "There's an expectation that MONUC (the U.N. mission) with its limited resources could do everything," Guehenno said. "I think it's likely we will need more troops." At a U.N. logistics base in Kinshasa, crowds broke down the main door and began looting, U.N. spokesman Hama-doun Toure said. U.N. soldiers inside opened fire, killing two protesters and wounding one, he said. "They entered, and there were very many of them," Toure said. He said that U.N. forces fired in self-defense, adding: "We regret this deeply because our mission was to establish peace in the country but we were left with no choice." State radio put the toll at the U.N. base at five. Separately, Congolese security forces fired - apparently into the air - to hold back thousands of protesters besieging U.N. mission headquarters in the heart of Kinshasa. Shattered glass and stones and wood surrounded the cordons of Congolese soldiers. Protesters also burned the offices of former rebel Jean-Pierre Bemba, one of four vice presidents in the power-sharing government, officials said. Gunshots echoed across the city center, sending panicked crowds stampeding. The city calmed by early afternoon, leaving exhausted demonstrators picking their way home through burned vehicles, tires and barricades. Kurdura Kasongo, a Kabila spokesman, declared that the rioters had been "spontaneously expressing their attachment to national unity." But the turmoil in Kinshasa and Bukavu showed the weakness of the government, and it was unclear how much damage had been done to efforts to achieve stability and peace. Yesterday's protests were the largest in the capital since at least 1997, when longtime dictator Mobutu Sese Seko fell, sending Congo into the 1998-2002 war. The war drew in the armies of six foreign nations - including Rwanda - and split the country. The conflict, and the famine and disease it brought, killed an estimated 3.5 million people.